The bullet-shaped carving found in 16th c. New Mexican furniture is also found in chipcarved decorations that adorn 18th c. Dutch planes. A similar shape, an inset finger pull, is found on sliding lid candle boxes from the 18th and 19th c.
Maybe that shape has shown up all over the world because it's so easy to make. In the photos at right, I did not make the Dutch planes* (of course), but I did make the New Mexican style cabinet and sliding lid box. 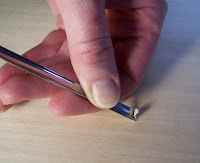 For the bullet shape, use a gouge with a pronounced curve. 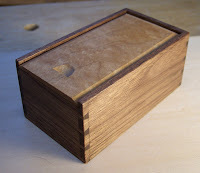 I used a #10/12mm straight gouge. 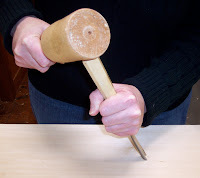 Hold the gouge about 60 or so degrees to your workpiece—leaning the tool back a bit so the o uter tips of the blade do not enter the wood—and strike it with a mallet. If you make this cut perfectly vertical, your bullet shape will look like it has little horns, which of course you might prefer. Next, begin the second cut as far back from the first cut as you would like for the length of the bullet to be. Start with a shallow cut that increases in depth until you reach the initial cut. The chip should pop right out. 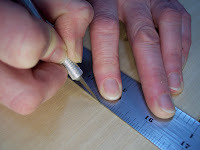 The finger pull is a similar procedure, except I make the initial cut with an exacto blade, and a more shallow gouge (I used a #5) is used to make the second cut. The knife incision is a straight line and deepest at its center. I keep a little nylon brush on hand to remove chips that don't want to "pop right out." 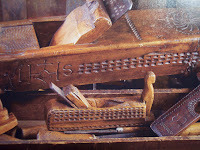 *Photo of Dutch planes is from Sandor Nagyszalancy's book The Art of Fine Tools.